Back in August of 2014, 3DPrint.com broke a story on a project originating from New York City architect/contractor Adam Kushner, and the company which he is the president of, D-Shape Enterprises. That project was one of massive scale, something never seen before within the 3D printing space. Kushner had come up with a plan to 3D print an entire estate in upstate New York, consisting of a 3D printed 2400-square-foot house and a large 3D printed swimming pool, as well as a pool house and car port which will also be 3D printed. At the time, all that Kushner had to present were architectural drawings depicting how the enormous estate would be laid out. This past week at MecklerMedia‘s 3D Print Week NY event, both Kushner and the CEO of D-Shape, James Wolff, were on hand to discuss further details of Kushner’s mammoth project. The project will be undertaken in a location about 85 miles from New York City, on a 5-acre parcel of land that Kushner and his wife purchased back in the spring of 2012. Kushner and his wife absolutely fell in love with the land, which provides for a perfect setting for a 3D printed estate. 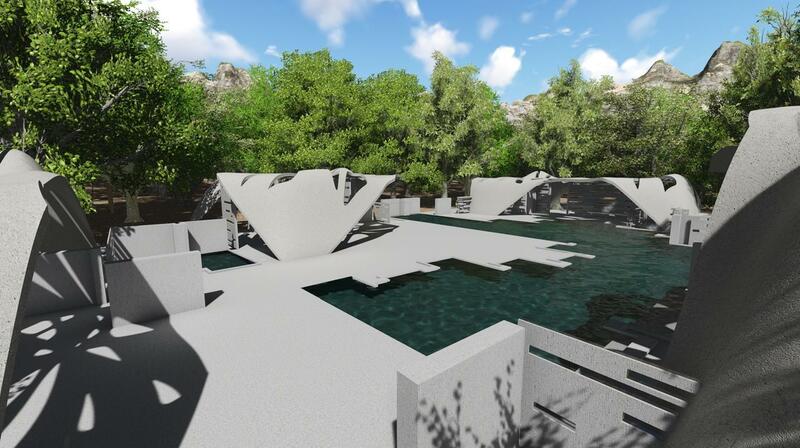 The plan for the estate is designed to reflect the geomorphology of the rocks found on the site itself. Kushner and D-Shape plan on 3D printing the estate using these rocks for aggregates which are found on the site. This method of construction is referred to as in situ resource utilization, and if D-Shape is successful, this could quite feasibly become a viable construction method of the future. Unlike other large-scale 3D printers, which companies like WinSun and individuals such as Professor Behrokh Khoshnevis and architect Andrey Rudenko have used in the printing of large-scale structures, D-Shape’s printers are different. While the aforementioned individuals and companies utilize printers which more or less print using a deposition-based model similar to what we see with FFF-based desktop 3D printers — except replacing the heated thermoplastic extrusion process with pressure-based concrete extrusion — D-Shape uses a different type of printer. The printers that D-Shape uses are invented by D-Shape founder Enrico Dini, and they print using on-site resources, combined with a magnesium-based binding agent. If WinSun and Rudenko’s methods of printing were comparable to desktop FFF-based 3D printers, these machines could be comparable to inkjet-based 3D printers. This means that many more architectural designs are possible, without the need for manually assembling and moving the printed pieces around. D-Shape will be able to completely 3D print these structures using the same in situ resources (sands) which create the structures, to also act as support for the construction of the structures themselves. The project, which is expected to kick off construction soon, will rely on traditional cast-in-place footings which will be put in place as Kushner awaits the delivery of the large-scale 3D printer from Italy. The manual placement of these footers is being done this way because it is quicker than having to wait for approval and the arrival of the printer itself. Kushner stated that they have actually 3D printed directly on soil in the past, so it would definitely be feasible to print the footers if so desired. The 3D printer is slated to arrive in NY sometime in May (2015), as it is currently awaiting approval by NATO, which Kushner joked essentially states that he isn’t bringing a weapon of mass destruction into the country. By the 1st of June, they hope to have begun the first trials and test prints using this new machine. Kushner is building this estate for his family to live in, yet at the same time, it will be a way in which he can work out the kinks of the machine, making it production-ready for further use. They will start by 3D printing the pool, and then follow that with the pool house and car port, before ending on the most challenging piece of the project, the 2400-square-foot house itself. Kushner realizes that, on the surface, his project may seem ridiculous to some. He may merely appear as a wealthy individual looking to build a unique second home. While this is true to a certain degree, he emphasized that this project is actually more humanitarian than it seems. He is spending a long time contemplating methodologies that will lead to a means of producing affordable housing — something the world is in dire need of. He views this as a major paradigm shift in the way we build structures, and he feels that this method of construction is extremely significant, perhaps on par with how the elevator changed the skylines around the world, and how the automobile has shaped our modern day cities. The 3D printing method used by D-Shape will allow for a means of construction that wastes virtually no materials and causes no negative environmental impact. It is as “green” of a method of construction as we can conceive of today. 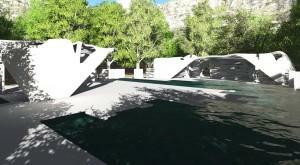 Kushner believes that 3D printing the pool on his estate will be the easiest aspect of this large project, with the printing of the pool house being next. However, the construction of the car port and ultimately the house will be the most challenging and complex, as he will have to figure out a method of 3D printing steel-reinforced concrete. 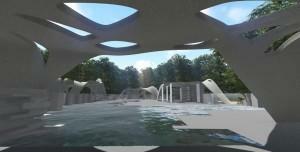 Once they are successful in 3D printing the car port, the next large step will be printing the house itself — a cantilever structure that will be “floating over the pool and site.” If all goes as planned Kushner hopes to have broken ground on this part of the project by the spring of 2016. When it comes down to it, no one has yet figured out a way to 3D print a structure that includes rebar within. Thus if successful, Kushner and D-Shape will open the door to what could become the next great revolution within the construction industry. Imagine the money saved, if entire homes could be printed from the ground up. The goal for D-Shape is to create a machine that has a dual printing head for both steel rebar and concrete, although this has not yet been determined as the method which they will use in the construction of Kushner’s home. Kushner said that they have also spoken with John Deere and Caterpillar about potentially incorporating some of their equipment into D-Shape’s future machines, which will allow the 3D printers to become mobile, opening even more doors within the construction industry. As mentioned above, the only materials used for the printing of these structures are on-site sands, salt water, and magnesium. The power requirement to run the machine is minimal. It runs on the equivalent of a 220V, 40 Amp circuit, which is basically the same power consumption as needed to run a Lincoln arc welder. Kushner believes that once proven, D-Shape’s technology will turn the architectural and construction worlds upside down, allowing virtually anyone with a license to 3D print their own homes, simply by leasing a machine. If true, this could do wonders in third world countries where supplies are greatly limited, and money is sparse. If you can take on-site resources, feed them through a 3D printer, and end up with homes to live in, this technology could quite easily be one of the greatest breakthroughs of the 21st century. It all starts this spring in New York, as Kushner and D-Shape attempt to make history. I’m not just talking about the kind of history that is recorded in the Guinness Book of World Records or is archived in the New York Times. I’m talking about the type of history that ends up in history books all around the world, which people study for millennia. D-Shape isn’t willing to just stop there either. Their next plan is to conquer the moon, hopefully through a partnership with the European Space Agency to 3D print moon bases. What do you think? Is this the future of the construction industry? Will D-Shape and Kushner succeed? Discuss in the 3D Printed Estate in New York forum thread on 3DPB.com. Check out some more photos below.